I was wondering if anyone has a ponytail palm. It's also called a bottle plant or elephant plant. I got mine about a month ago and the fronds keep breaking and cracking about 4-5 inches from the top. I know that it's a succulent, and so I have it in well draining soil and water it about every two weeks. Any ideas? no clue. i've had mine a couple of months and it is great. i don't do much with it, other than it is in the kitchen where it stays moist, but i don't water it very often. i know they mail really well!!! I don't know about them, either, but here are some interesting sites with some info and pics. The one growing outdoors (middle site) is impressive. How are you going to keep that in your livingroom? 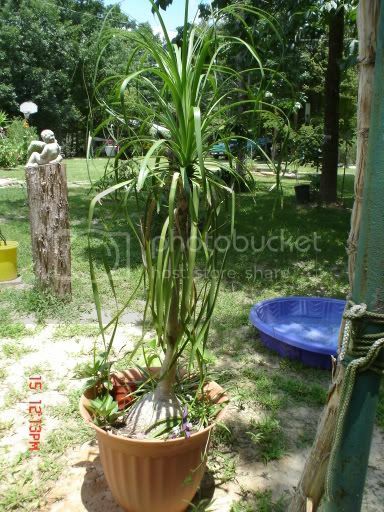 I have had my ponytail palm for about 3 years now...it is literally teetering on top of the soil in its pot,but still living!sounds bad of me.,I know. I would like to plant it in the garden,but still looking for just the right spot! the little bulb in the soil is like a camel hump. it holds water for a long time.they like full sun,but will live just about anywhere. I only water mine about every week and a half to 2 weeks.pretty little plant that is pretty darn hardy! hope that helps. Thanks! I think my problem is probably over watering. I moved it outside so it'll get more sun & heat. It is very hot here! And don't worry Margaret! My little tree is only about 2 feet tall. One of the links you posted said that they only grow 8 feet in a pot. So thanks everyone for the great info! I have a half dozen of these Lisa and i don't water them at all. They survive on the rain and we haven't had much for the last few years. I have one in a half wine barrel and found it was dropping leaves regularly and i put it down to excessive water. So now it gets none and it is definitely in better condition because of it. Also, ensure you didn't plant it too deep. The top half of the 'ball' should be above ground level, or even more can be exposed if you like. mine gets some sunlight but is filtered hottest part of day& I cold greenhoouse it in the winter.Its basically protected from frost& don't sit in freezeing temps,but its not a sheet canidate when we get freezes(mostly a size thing)Hubby about killed it in the spring.He set a bowl of pine cleaner on railing and it rained.he killed my other pony tail type palm,but I'm useing its pot as a canna seed nursey and is a small green bump that i'm watching for life. you can't see it very well,but the one still kicking is behind it.I'll get a shot of my other ponytail.I have a spider plant and red kolonchoe that grow at its base.I've not had it flower yet either. I've had it for 2 years.I'm unsure how long my neighbor had it.I repotted both of them when I got them.